Guilford College Lot located at 5804 Hunt Club Road which is about a half block off Guilford College Road and Friendly Avenue (behind Hardees). New Garden Lot located at 1653 New Garden Road which is on the corner of New Garden and Horse Pen Creek Road. Our Christmas tree farm is in Sparta, North Carolina. The trees are cut fresh every few days during the Christmas season and shipped to the Greensboro tree lots. Fresh wreaths and roping are made daily and trees range in size from 2 feet to 12 feet. Bryan Wagoner is a second generation Christmas tree grower, who’s been growing and selling Christmas trees his whole life with his father and brother. 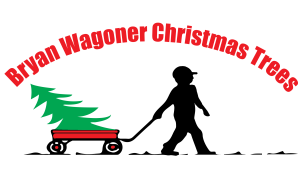 Bryan’s father, John Bryan Wagoner, began selling Christmas trees in the late 1930’s and has sold them in Greensboro and Burlington for over 70 years. Bryan’s been selling trees at his Greensboro tree lots since 1985. At Bryan Wagoner Christmas Tree lots, we give fresh cuts on the tree that you select, then put the tree in a stand, and bale it in netting. We are a full service Christmas tree lot and we are an environmentally conscious tree farm.